It took a while to work out, but it was obvious in the end - the graphic features two barrels. 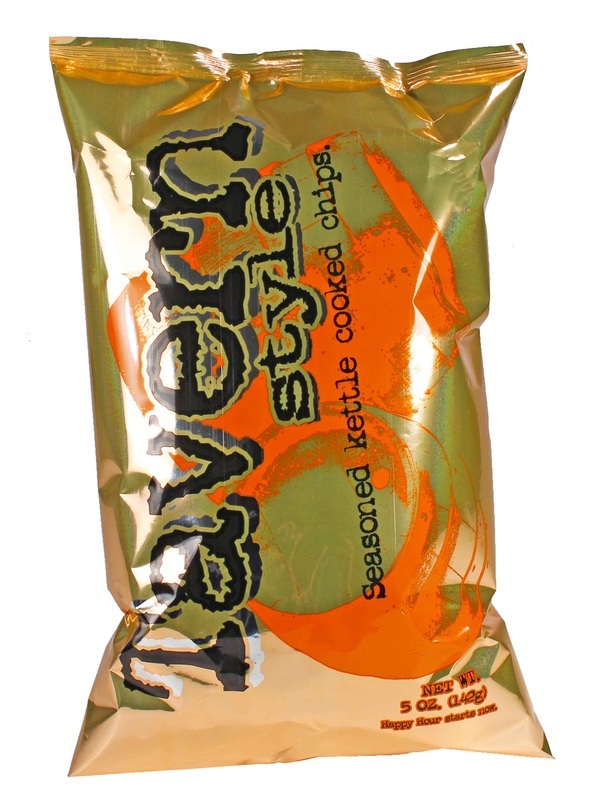 We were also intrigued, what could 'Tavern Style mean'? The only real question about the packaging was, why so similar to Beer Chips? What would have been wrong with another bright color that would have stood out in a pub or Tavern - silver, perhaps? 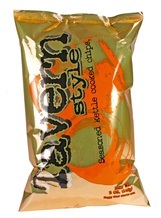 Apart from that; another great bag from Beer Chips. There were some extra crunchy hard Chips, but mostly the Chips were whole and misshapen which gave them character. Kettle Cooked Chips are always crunchy though, and these were no exception. Thin, curly, some folded, a touch of seasoning on the surface but not much. A little over greasy in parts, but this was not consistent throughout the bag. Tavern Style Seasoned was a bit ambiguous. We were fooled - all the other varieties claim to be 'flavored', these were 'seasoned'. And to think we hoped they could smell of stale smoke and taste of beer soaked wooden tables. Well maybe not, but getting back to the point - the ambiguity of the seasoning meant it was just a random flavor. A bit sticky and sweet, a little salty and garlic tasting.